The online software provider Loc8 recently released the new version of its platform as well as the new version of its mobile application. Last month, Loc8 released the fourth version of its software which enables all users to increase performance and productivity. 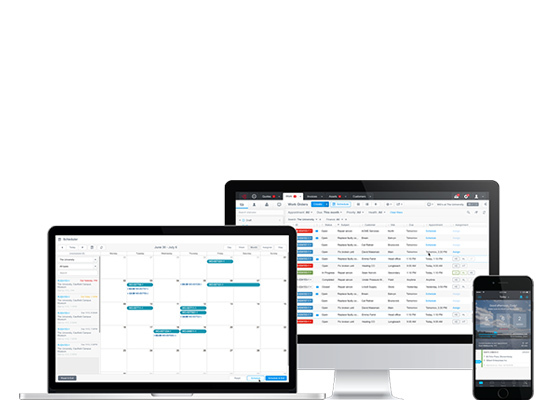 More powerful and provided with smart new features, it is now possible to quote, invoice, schedule and so much more; customer service has never been so straightforward! With a range of three different editions including Service, Enterprise and Team, Loc8 is a platform designed for companies of all sizes. The most popular edition being Service with its preventative maintenance features, it mostly appeals to medium and large service teams who require a complete field service and asset management solution. For larger companies, the Enterprise edition is the recommended solution as it offers extended support and enables integrations with other platforms. Finally, Loc8 also offers Team, the free edition for small field service teams and subcontractors. Loc8’s new platform offers a complete overview of all staff and collaborators within a company. From this same platform, it is very simple to create work orders and set appointments to then assign to technicians for completion via the powerful and intuitive Loc8 mobile apps. Loc8 ships with a full suite of appointments scheduling tools, from basic real-time slot section through to advanced resource availability. The new software also enables a real-time activity stream, in order to follow-up on technicians’ work progression as they go. This new version has been designed with the goal to improve processes, field operations and customer service. As a result, it is now possible to create schedules for different asset classes, customers and sites which automatically generate work orders for the relevant assets. So, in other words, it is now possible to solve customers’ issues before they occur. Loc8’s new platform establishes real communication with customers and teams via custom notifications. A smooth communication flow is key and this is why Loc8 Service Supply Chain, an award winning solution, allows service providers and sub-contractors to collaborate on work orders, whilst ensuring full operational integrity and control. SCOTT PATON – Chief Operating Officer, VYSIONICS ITS LTD.
Loc8 Mobile offers a direct integration to the Loc8 suite with real time dispatch and notifications of new work orders and updates. It is the in-field technician solution for Loc8’s licensed users. Available on the App Store and Google Play, Loc8 Mobile replaces current paper or spreadsheet based job sheets with a highly usable, smart application that connects Loc8 managers, back office staff and field technicians. This application drastically simplifies work days by allowing technicians to manage everything from simple reactive work orders to complex scheduled maintenance on assets and capture customer’s signature digitally when the job is completed. With this new version, it is now possible to change the status of an asset, view and edit custom fields on an asset as well as view and update asset and site coordinates on a map. Loc8 Mobile demonstrates that efficiency and safety are two compatible terminologies. In order to minimize any kind of danger, there is the possibility to let technicians view site safety notes for any work order. Workers can use the application without an internet connection thanks to the offline connection enabling them to deliver great service anywhere. Smarter, quicker and prettier, the new Loc8’s products aim at redefining customer service and proposing a more practical approach regarding processes and field operations. *It is important to note that this application requires a Loc8 account in order to be used. Also, continued use of GPS can dramatically decrease battery life.